Everyone knows that I am all about the air attacks. At BH4, I shift my focus from Raged Barbarians and Sneaky Archers into Beta Minions. I max them out and that becomes my go to attack strat all the way up to BH6 or BH7. On some of my games, I will max Night Witches at BH6 and use Mitch, but I’ve found Mass Beta Minion to be adequate to task for my alts and solid against most base designs. The Beta Minion first comes available at BH3 and it has some uses there, but it doesn't really start to shine until you get it upgraded to level 10. 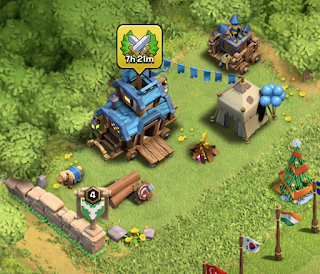 At level 10, you can have 8 in each camp - that's a total of 32 in a single raid. Level 12 Beta Minions at BH6 are even better with 10 in each camp (40 in all) and when you get the fifth camp at BH7 not to mention a fifth shot on the Long Shot ability, things just keep getting better. It’s been a while since we talked about Minion Drops and there have been a few questions around things like deployment strategies, how many camps to use, and where the Battle Machine fits into the picture. The primary purpose of low level Drop Ships is as a tank.At lower levels, the sole function and purpose of the Drop Ships is to support the Beta Minions by keeping them alive in the attack.They take fire from the Roaster, FireCrackers, and even a few hits from Airbombs along the way. CoC December 2017, Winter Update is here! The 2017 winter update for Clash of Clans is out and, as promised, it's all about the main game. First, let's talk about the bad. There are nerfs in this update. Miners go from 5 troop units to 6 troop units. X-bows lose 10 points of DPS at levels 2, 3, and 4. I'm not fond of either of those, but the real biggie - the Inferno Towers lose the anti-healing aspect of their attack. That means you'll be able to heal troops that are under attack by the Inferno Towers. OK - let's talk upgrade strategies! I've put up a few upgrade guides now, and we've talked about how to rush the Builder's Base, but we haven't really tied it all together. On all of my games, I have a basic idea of how I want to develop each from start to finish. Each was started at a different time and has run a slightly different upgrade path. This was intentional - it lets me get an idea for what works, what doesn't, and keeps me up and down the trophy rankings. My flagship game, Noctaire, is the furthest along of all of the games. This game has enjoyed some light gemming - a few levels on the Roaster, Night Witch upgrades, several levels of Drop Ship upgrades, and the BH7 Bonus Pack. The initial goal with this game was to upgrade Beta Minions then other troops while upgrading first air-targeting defenses (FireCrackers, AirBombs, Hidden Teslas) before moving on to other defenses like the MultiMortar, Roaster, Crushers, etc. The basic principles of base design haven't changed much since our Base Building 101 article/video. 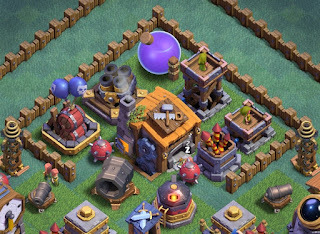 BH7 (the current top level Builder Hall) adds a few new structures, including the Giant Cannon, second FireCrackers, and second Hidden Tesla but the general rules remain. Let's talk about a more specific base design concept - the strong hub. Many bases will place the BH itself in the middle of the base and surround it with defenses. The idea is that players will have to work their way through a host of defenses on any side to get to the juicy center and even then, the overlapping target ranges of defenses protecting the middle will be firing upon them. Ideally, the attacker's troops will be well depleted by the time they make it to the BH in the middle and the remaining defenses will finish them off. CoC BB - Matchmaker...how DOES it work? One of the biggest conundrums in the Builder Base game is the matchmaker. When you're new to the game, you might find yourself very surprised when suddenly you are being matched against stronger players - consistently. I mean...how can my BH6 game be constantly matched up with BH7 games? There are a lot of little things that factor into the match-ups, but the actual match itself is determine simply by where you sit in the trophy rankings. If you are a BH5 at 2500 trophies and there's a BH7 at 2500 trophies, and you're both online playing at the same time...well...you two might just end up matched to each other. The BH level itself simply isn't a factor. So, the REAL question we need to ask ourselves - how do I end up with a trophy ranking that makes ME competitive with a BH7 when I'm only a BH5?! THAT is a more complicated answer. SuperCell has told us that the ranking system used on the Builder Base is their own version of the "Elo Rating System".